Youth Hostel Anna kohteessa Santorini, Kreikka: Varaa nyt! We kindly inform you that the new management of the Youth Hostel Anna welcomes our customers with joy and the guaranty that they will be pleased by our renovated installations. The rooms and the bathrooms (new showers and toilets are built this year 2017) are also renovated and very clean according to European rules and standards. All the dorms are airconditioned.! The private rooms(located in another building) have aircondition,freedge,safe-box,private balcony and swimming pool.!! 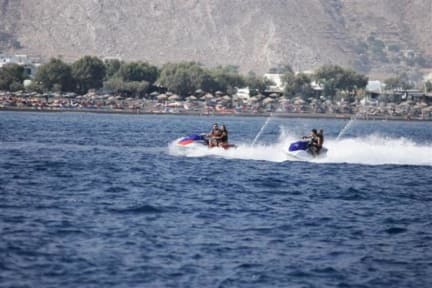 Our Hostel is situated in Perissa beach , in the south eastern part of Santorini. The distance between the Youth Hostel Anna and the beach is only a two-minute walk. Perissa beach is very popular for its black sand and the deep blue sea where you can enjoy swimming, diving and other sea sports. -or even scuba diving and snorkeling activities, leave it to our responsible staff. Our place promices you a pleasant and friendly service to make your vacation unforgetable...!!!!! IMPORTANT NOTICE : We provide pick up service for our guests, from the port and from the airport.To arrange your pick up with us please send us an E-mail with your arrival details at least 2 days before your arrival.... Thank you!! !